Today is the fifth Sunday of the month, which makes the farmers’s market a chancy one – a lot of stallholders come in one Sunday a month, or on the first and third or second and fourth, so the fifth Sunday tends to get only those who are there all the time, or those who are rotating through a number of markets in an order that is less evident to me than normal. This time around, fifth Sunday translated to a lot more stalls with ready-made foods than usual – pasta, pies, tarts, cakes, bread, jam, cheese, pestos and olive oils – but there was also the citrus stall, the apple and pear stall, one of the potato stalls, the mushroom man, a couple of meat stalls (including Koallah, who I did not need to buy from as they have just knocked on the door and delivered my order for this week), and, best of all, my favourite Italian lady. Due to the vagaries of alternate weekends, I won’t be seeing her again until November – I told her this, and she said I must make sure I keep buying the good stuff! 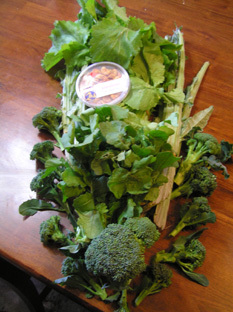 – so I had to stock up on cardoons and sprouting broccoli and wild greens (which I *still* can’t identify. I know I got rapa this time, and that I did not get the bitter milk thistle, which I do not fancy, but the other has gone completely out of my head). The good stuff. Because the Italian lady told me to. And also because it tastes really, really good. I also decided to try some of her dried broad beans with chilli, even though she looked at me a bit dubiously and told me they were quite hot and I might prefer the garlic. They are quite hot, but they are also very tasty, and will make nice snacks in my lunchbox. The normal pie man wasn’t there, but there was a different pie shop with big, family-sized pies. I decided I couldn’t resist the rhubarb pie, and nor could I resist the rhubarb sets being sold next door by the mushroom man. So after this, I’m going to have to go outside and plant rhubarb somewhere likely, possibly stopping first to dig in the bokashi buckets that have been languishing on the porch for an embarrassing length of time (on the bright side, they are probably very well composted by now). 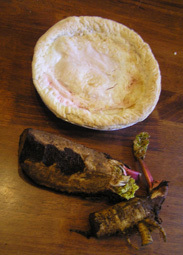 Rhubarb under pastry, and rhubarb waiting to be underground. 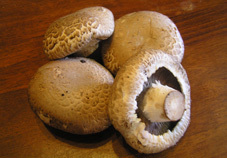 And of course, the huge swiss brown mushrooms were irresistible, singing as they do of giant roasted mushroom sandwiches, or perhaps of marvellous and as-yet-unknown stuffings. I think I’ve mentioned that it is now blood orange season, which means that I am required by statute to buy blood oranges on every occasion on which I can get my hands on them, regardless of whether I really need them or not. So I bought a handful of blood oranges, which I think are going to become jellies of the dessert variety as well as the confectionery kind. I made blood orange curd cheesecake yesterday, with some of the oranges from the previous market, and it was fabulous (and also not blue, which was something of a relief – being wise to the ways of anthocyanins, I kept the juice well away from any egg-whites, but I still had a moment of fear when I added the egg yolks to the curd). And since one cannot live by blood orange alone, I also bought some nice, happy-looking apples. 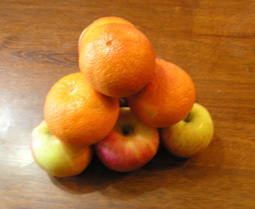 You can’t compare apples and oranges, but you can stack them into pretty pyramids and take photos of them. The potato guy seems to be getting better at dealing with a customer who bounces up to him saying “Hello! What potatoes am I getting today?”. These potatoes are called Valor, and are apparently good for roasting, which is one of my favourite things to do with potatoes anyway. The stall next door had kale (I’m thinking that kale and roast potatoes will go admirably with the chilli sausages I’ve ordered from Koallah farm), leeks, and whole pumpkins, which are just one of those things that are too beautiful not to buy, so of course I bought them. Actually, that looks like a pretty good soup, doesn’t it? I mean, not as it stands, obviously, because soups are not usually triangular, even when I’m the one making them, but leek, potato, pumpkin and kale definitely sound like soup to me. I can’t resist the Carmen Miranda fruit bread from the Redbeard bakery, especially when breakfasts of late have been alternating between dried fruit and nuts, chocolate brownies (oh dear) and nothing at all. This will definitely be a healthier way to start the week. My plan was to be sensible and get some nice, good-quality olive oil from the stallholder who eagerly told me that her oils were just pressed this week – but I was seduced by a blood-orange infused olive oil which I didn’t even need to taste to know that it was absolutely necessary to my kitchen. I have visions of chocolate olive oil mousse with the blood orange infused through it, and of salads of wild greens, oranges and pine-nuts dressed with blood orange olive oil and red wine vinegar. Yum. The stallholder threw in an olive oil soap, scented with rose geranium, too. With $8 left in my budget, I decided that a little bit of cheese would be just about right, so I now have cheshire cheese, which for some reason I’m associating with leeks just now. Perhaps later I’ll find out why. 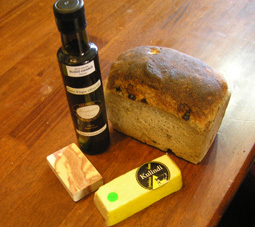 Elements of life: bread, cheese, olive oil, and soap. One does not have to eat the soap, however. And Koallah Farm has just delivered my lamb leg and diced lamb, my beef mince and steaks, my sausages and my free-range eggs. Right now, I feel as though I won’t need to go shopping for a fortnight (or for a month, in the case of meat. That’s a lot of meat by our standards). Well, maybe for pasta, and some garlic and tinned tomatoes – which are my personal elements of life in the kitchen! Is there any main meal that isn’t improved by one or all of these? Or any larder that is truly bare when you have these three things with which to make supper? 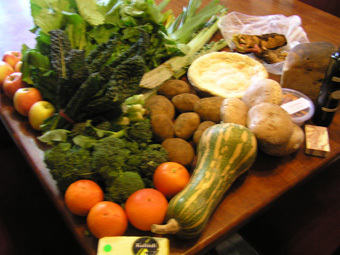 Farmers’ Market: Is it really Spring? I cannot tell you how long I hunted helplessly through the photographs looking for the pumpkin before it occurred to me that I might be suffering from a difficulty with language, and that by “pumpkin” you meant that lovely long striped object that I would probably call a squash. Oh dear! And also, how interesting – I had gathered, from the US cookbooks I have that pumpkin = winter squash = any large, tough-skinned fruit of a vine with big umbrella-like flat leaves that one might cheerfully roast or use in a pie. I take it that pumpkin is more specific than that? The big round things, maybe? For Australian English speakers, it’s all pumpkins. The only thing I’ve ever seen labelled as a squash in the supermarket are the little yellow pattypan squashes (that look like cupcakes, especially if you steam or bake them, take off their lids, fill them with pesto and make them into butterfly pattypan squashes). Also… probably call a squash? What else might you call it? Americans call pumpkins the elliptical-ish, orange things that one carves into Jack-o-Lanterns. Really braves souls out here will grow a variety that is extra meaty and can be used for cooking. 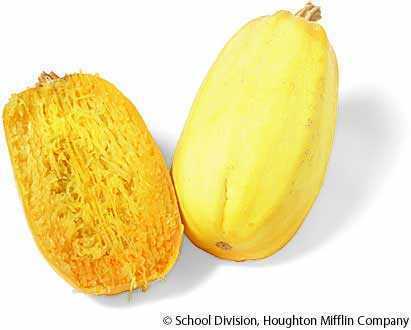 Most anything else we call a squash: Spaghetti Squash, Acorn Squash, Butternut Squash, Summer Squash (yellow zucchini’s), etc. We’re pretty botanically indecisive that way. 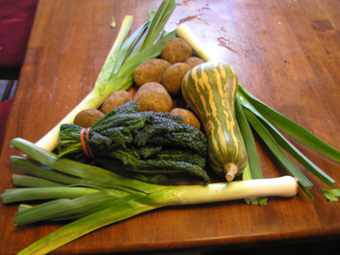 I have a great recipe for potato leek (vegan) soup that’s great for the summer. I highly recommend experimentation! I wondered if that was it. Acorn squash are very different to what I expected – I thought they might be the same as our pattypan squash, but apparently not. 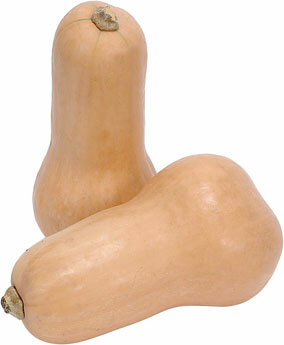 Squash is definitely an intrinsically amusing word. It’s also pretty entertaining when repeated out loud.